We received items for the purpose of this review. What makes me smile? Well, many things make me smile! My children, of course (well, most of the time), my husband, my pets... and sometimes myself. I've been dealing with a few health issues recently, and one of my biggest fears has always been surgery. 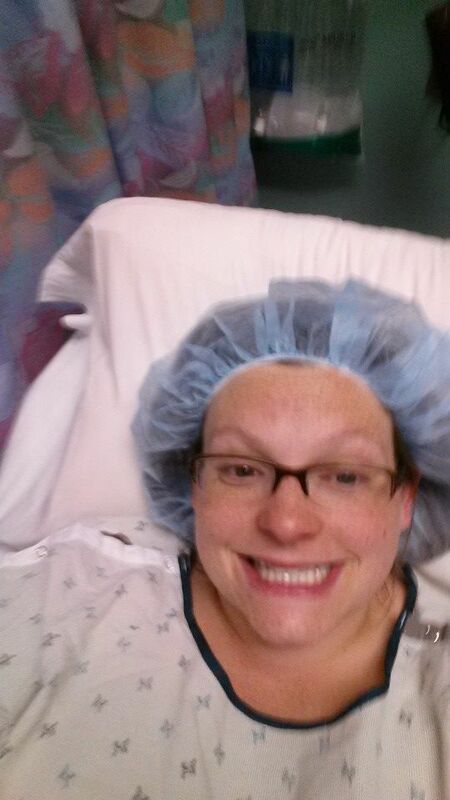 I have always been terrified of general anesthesia. Well, on July 1st I had to face this fear. Something that makes me smile is the photo I took of my (very, very nervous and scared) self while in surgery prep.It's not a very good photo of me, I am teary eyed and faking a huge fake smile. It makes me smile now, however, because I put on that smile and faced my fear... and because I look absolutely ridiculous in a hospital gown and paper cap. No, really, I am proud of this moment, and very glad to have survived to look back on this. One of my favorite personal features is my smile. It's important to me to keep it looking good. One of the best ways to do this is to brush and floss daily...and of course, to brush and floss daily you will need the supplies to do so! 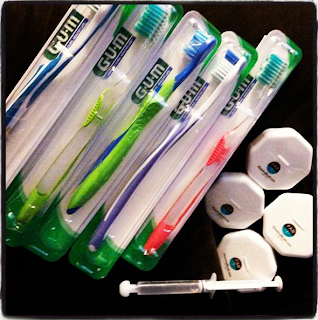 Did you know that you are supposed to replace your toothbrush every 3 months? Well, that's what the The American Dental Association recommends. FlossAndBrush.com makes it easy to always have new toothbrushes every three months. How? By paying just $1.00 per month, per person in your family, FlossAndBrush.com will ship a box of fresh, quality toothbrushes and floss to your home – one for each member of your family. FlossAndBrush.com is the first system in the world that actually helps keep families accountable for daily flossing and changing their toothbrush every three months. More information can be found here: http://bit.ly/19cNlzQ. We received our first shipment of toothbrushes and floss recently. One concern I had was that we would receive several duplicate toothbrushes (maybe even all the same ones). I was very happy that each of the toothbrushes were different colors (which is very helpful so that everyone can identify their own toothbrush). I was extremely impressed with how much floss we received, 60 yards is a LOT of floss per person. Overall, I couldn't be happier with the products that we were sent. They were all quality items and worth every penny the of the $1 per month cost. The syringe you see in the photo is filled with whitener. You can receive this for $1 more per month per member. Shipping is $1 per member, or free if you order 3 or more packages. 1 Free Annual FAB Membership (every three months, a new toothbrush and 3 month supply of floss will arrive at the winner’s doorstep). 1 Free Annual FAB + White4Life Memberships (this includes not only a toothbrush and floss every three months but each shipment will also include FAB’s professional grade whitening to be used in custom whitening trays).